ARRA | Strategic Networks Group, Inc.
(October 28, 2010) e-NC and SNG announced today the findings of a comprehensive study of residents and businesses in the state of North Carolina. In all, 30,000 households and 70,000 businesses and organizations were surveyed to uncover utilization of broadband and e-solutions statewide, with 1,492 households and 6,266 businesses and organizations responding. The e-Solutions Benchmarking and accompanying e-Strategy report from SNG was funded by a grant to the e-North Carolina Authority by the National Telecommunications and Information Administration (NTIA) of the U.S. Department of Commerce. Nearly one in five (18%) of new jobs were created as a direct result of Broadband Internet. Small businesses (less than 20 employees) are especially dependent on Broadband Internet as 28 percent of new jobs in that sector are attributed to using the Internet. Most (85%) of home-based businesses said that broadband was essential to their business. By employing e-strategies on multiple fronts, North Carolina will be poised to further leverage broadband for job development and economic growth. The e-NC Authority is the state initiative to link all North Carolinians – especially those in rural areas – to the Internet. The purpose of this organization is to use the Internet as a tool for helping people to improve their quality of life. Affordable Internet service will provide North Carolinians with increased access to commerce, health care, education and government services. Through the Internet, rural North Carolinians can utilize resources not located in their areas, contact friends and experts, grow their businesses and increase their personal knowledge – all while preserving the lifestyle that is an integral part of who they are. The e-NC Authority was preceded by the Rural Internet Access Authority, and was created on Aug. 2, 2000 by the N.C. General Assembly. The organization became fully functional in January 2001 and is governed by a commission appointed by the governor and the N.C. General Assembly. By legislative mandate, the e-NC Authority is housed and staffed by the N.C. Rural Economic Development Center. Visit www.e-nc.org. In June, we announced SNG’s popular new offering: the Digital Economy index (DEi). A composite score of how organizations use seventeen (17) Internet-enabled applications, or “e-solutions,” DEi is a unique assessment tool that can be used at any industry, sectoral, or geographic analysis of businesses and organizations to drive productivity and competitiveness. DEI enables businesses and organizations to see where they stand relative to their peers. It can also produce customized scorecards at an individual organizational level showing where improvements can be made to be more productive and competitive in the 21st century knowledge economy. As SNG’s DEi is a composite score of how organizations use Internet-enabled applications, or “e-solutions,” to drive productivity and competitiveness, DEi can also be shown strengths and weaknesses within industry sectors. As we’ve just completed our latest work in North Carolina, let’s take a look at the DEi results by industry and sectors for North Carolina. The overall median DEi for all organizations surveyed in North Carolina is 6.99, with 50 percent of organizations falling between a DEi of 5.34 and 8.45. These scores compare utilization of e-solutions between industry sectors and we’ll explore what that means below. Opportunities for increasing DEi, with resulting economic benefits, can be identified for potential action to increase the utilization of e-solutions by businesses and organizations. For example, in North Carolina, the Construction industry (DEi = 6.17) and Information Services industry (DEi = 8.16) have among the lowest and highest median use of 17 types of Internet applications or processes. The average DEi for North Carolina was 6.99 (high is better). 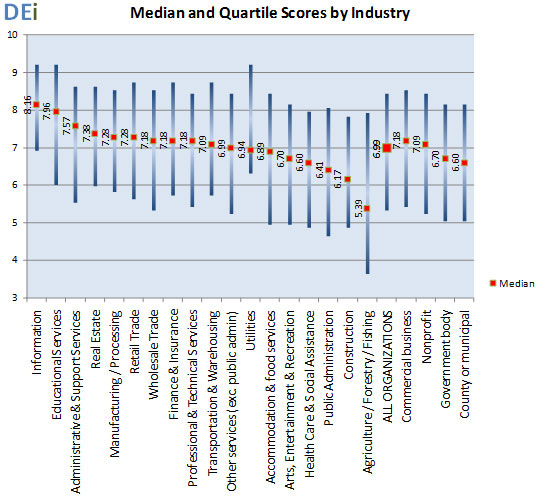 Some of the differences in the DEi score reflect unique characteristics of the structure of that industry. For example, the Construction industry has very high use of certain applications, such as supply chain management and document transfer, while having low use of tele-working. One interesting example of using the DEi is a comparison of the Education industry (high DEi of 7.96) and Health and Human Services industry (low DEi of 6.60). Comparing these two industries highlights the extent to which the Education industry has pioneered such Internet uses as direct service delivery and remote counselling, while Health and Human Services lag significantly in these areas. SNG’s proprietary DEi analysis is very useful in designing initiatives aimed at increasing the level and productivity of broadband adoption. For proponents of broadband as a critical tool for economic development, DEi shows where organizations and industries are leveraging broadband – and where they should be employing more e-solutions. It took several weeks to sort out, but Australia’s hung parliament emerged with the Labor party still in power – and the National Broadband Network (NBN) very much alive and well. 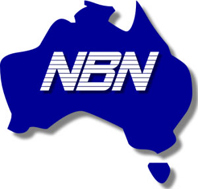 As a refresher, the proposed plan by the Labor party for a $43 billion National Broadband Network (NBN) will provide 100 megabits per second broadband access to approximately 93 percent of the Australian premises. Currently around 62 percent of households have broadband now but – for the most part – it is slow and expensive. In conjunction, the plan calls for a boost in broadband investment for businesses with hopes that it will directly support economic growth during the rollout. The influential Australian Industry Group lobby calls the NBN an “unprecedented opportunity” for business innovation and with the ubiquitous nature of the fibre roll-out – bringing with it unparalleled speed and reliability. The group cites the long term opportunities that broadband “everywhere” brings, creating an environment where Australian businesses are able to create services and business models that do not yet exist on a network which will give Australia the fastest internet access in the world. Some of the NBN’s first cables are being laid in Willunga. This is trial site in Southern Australia; one of five across mainland Australia. The state of Tasmania is already offering fibre-based services as part of the NBN roll-out and hopes to complete its roll-out by 2015; at least 3 years ahead of the mainland. The Australian roll-out target is expressed in terms of coverage: any premise in a street with fibre rolled down it must be connected within a few days of demand. Naturally, free connections are being offered as the roll-out takes place. Activation only occurs where a customer asks a retail service provider to provide service over the fibre. Surprisingly, only 50 percent of households in Tasmania have taken the free connection compared with over 80 percent in the mainland trial sites. It is not clear what explains Tasmania’s experience. Perhaps communication is poor (i.e. low or no awareness campaign activity) and customers expect Telstra’s copper network to remain; Telstra is planning to migrate all its customers to the new network. Tasmania is passing legislation requiring customers to provide written notice if they wish to opt-out of a free connection (versus opt-in as now). Worse, less than 1 in 10 customers connected in Tasmania have chosen to activate a broadband service over fiber. Perhaps, the offers made by several internet service providers are not attractive. A leading provider, iiNet, is providing exactly the same plans on fiber in terms of price and down load caps as it offers for ADSL2+ except that until June 2011 the down/up stream speeds will be increased from 25/2 (same as ADSL2+) to 100/8 Mb/s. Customers may prefer to stay with their current connection on ADSL2+ than become “guinea pigs” on the NBN network. That coupled with the “hassle” of changing providers, the question becomes whether the broadband status quo is unacceptable enough for people to spend the time and money to switch to the NBN? And do citizens understand the value of the opportunities afforded by the new fibre network? The uptake challenges illustrate what we always say – Field of Dreams is a nice movie, but “build it and they will come” does not work in the real world. To ensure that individual businesses, organizations and households connect to the NBN, Australia’s leaders need to promote adoption of those e-solutions that are customized to their needs. To maximize the return on investment requires addressing local / regional drivers and barriers and with it appropriate awareness and adoption programs at a regional level. By following the Broadband Lifecycle, Australia will see major payoffs for their broadband investment in terms of productivity, competitiveness, and quality of life. As always, thank you for your continued support. If you have any questions or feedback, please don’t hesitate to get in touch! SNG is a group of broadband economists who develop strategies for most effectively leveraging broadband investments. We look to help make the most broad-reaching and transformational impacts that broadband can bring enable businesses, communities and regions by delivering the data and analysis decision makers need to maximize broadband’s potential. Our goals: economic development, social advancement, increased productivity and competiveness. Learn more about SNG online at www.sngroup.com and discover how broadband market analytics can accelerate regional economic development. Fill in the following form and you will receive a message in your inbox with a link to download the “North Caroline Findings 2010” PDF. With election results still trickling in over a week past election day, it is still unclear which party – the Liberals or incumbent Labor will emerge in power. The months and weeks leading up to the election were fascinating on many levels – but for our purposes, let’s just focus on one very significant issue – the National Broadband Network (NBN). Hotly contested, the proposed plan by the Labor party for a $43 billion National Broadband Network (NBN) would provide 100 megabits per second broadband access to approximately 93 percent of the population. Currently Australia has – for the most part – slow and expensive Internet service. In conjunction, the plan calls for a boost in broadband investment for businesses with hopes that it would directly support economic growth during the rollout. The other side of the aisle, the challenging Liberal party wants to scrap the plan in favour of a $6.3 billion, privately run alternative. All eyes in the broadband industry are waiting to see which side – and with them their broadband plan – would win out. Well we’re still waiting as the parliament remains hung while each side hope to sway Independents over to their side. What is the $43 billion based on and is that an appropriate level? Who should build it? – and operate it? What return on investment can Australia expect from its broadband investment – be $43 or $6 billion? Australia into a hotbed of technology and development? These are important questions and no matter the party affiliation, taxpayers should be told how their money will be used – and what benefits and outcomes to expect. Unfortunately, there has not been much discussion on the two most important aspects of this debate: how individual businesses, organizations and households would use the new broadband capacity – and what the economic or social impacts will be. Without that understanding there is no meaningful economic case, let alone business case, for investing in such a network. We refer to the economic case as many of the economic and social benefits are ‘off-balance sheet’ to the telcos. Support and urgency for high-speed and high quality broadband connectivity gets lost without this critical information on utilization and quantified impacts – information that should be part of any due diligence. For example, if looking at a certain hospital – are they using remote diagnostics, electronic patient records, etc. – and should they be if they don’t? For businesses, if their utilization of e-solutions and Internet-enabled business practices is not at par with their global competition … what share of business can they expect to win in a globally competitive economy? The community return on investment (Community ROI) needs to be understood because it is the only way that governments can justify using public monies to build broadband networks. Explanation of current versus future demand for broadband is based on the utilization of e-solutions. When investing, you need to identify and understand the gaps between how e-solutions are currently being used versus how e-solutions can and should be used to maximize economic and social benefits. It is business 101 – you identify the need, you understand your customers and then you build your product or service to address the needs of the customers you want to target. This approach is taken when building the hardware that makes-up broadband networks, but this approach seems to be put aside when those broadband networks are being designed and planned. Just like roads, high quality broadband networks enable economic activity and social services whose benefits far exceed the initial investment. SNG is a world leader in conducting such impact assessments of broadband and our work which has been quoted in the US’s Recovery Act that finds that for every dollar invested in broadband, there is a tenfold return on that investment to the community. Whichever party forms the majority, they need to approach high speed broadband network investments focused on the demand-side (current and future) with the understanding that they are building infrastructure that serves all sectors of a modern economy. To realize these productivity and competitiveness benefits, Australia needs to act decisively and quickly. The opportunity cost of broadband infrastructure being hostage to politics will be borne by the Australian people. In last month’s bandwidth, we discussed ‘smart grids’ and the fact that driving adoption requires awareness and a persuasive message. SNG’s recent studies show that the number of business owners and homeowners even aware of a smart grid falls under 5% of the population. This is a public relations and marketing problem for utilities and those promoting smart grids. Further results (as part of an e-Solutions Benchmarking study conducted by SNG) reveal that consumers, for the most part, are not willing to use the Internet to manage energy consumption in their homes and businesses. This is in spite of the fact that engaging this technology would bring financial and environmental gains (e.g. energy independence, global warming and emergency resilience issues – see Wikipedia on smartgrids). It points to just how big the job ahead is for providers of energy to convince consumers of the value of smart grid technology. Deployment needs to be embraced and not mandated (see last month’s article on how to drive adoption among different audiences). Beyond willingness to allow the local utility control of HVAC and major appliances in the home and business (of which less than 5% of consumers and small business are open to) – there is a major challenge to educate the public. “Demand Control,” “Demand Response,” and “Time-of-Use” rate structures currently being trialed are all concepts that need to be explained with something more compelling than a slip of paper stuck in a monthly bill. Demand control, the ability to reduce energy consumption during peak periods, is one way utilities can avoid construction of new generating facilities, relying instead on the eventual development of renewable sources. For instance, employing demand control on a smart grid could eliminate $3.5 billion on a new energy plant. With new smart meters installed, utilities have the ability to increase or decrease the per-unit energy cost dependent upon available supply and demand. The problem – and biggest challenge of smart grids – is that they are dependent on electric firms serving as center of control and allocating energy needs between those who are served first, who can be dialed back, and – worst case – who needs to be temporarily shut down. So we’re back to how to drive adoption of smart meters… the carrot or the stick? Smart meters being installed worldwide have the ability to send messages to individual Home Energy Management Systems, indicating rising demand and/or rising energy costs which will in turn causes consumers to modify behavior to better align with available power supply. (i.e. Raising or lowering a thermostat, delaying washing/drying dishes and laundry, etc. until the price subsides). Broadband connectivity is the backbone of the smart grid because it enables us to manage our energy consumption from anywhere. The key for every home and business worldwide is to understand what is now possible and to take control of energy consumption. Whether the connection is fiber, cellular, WiFi, WiMAX or satellite, communities with universal access offer residents and businesses an opportunity to the energy consumed from anywhere in the world with the potential for real bottom-line savings.While local electric utilities go through the process of investigating smart grid investments and how end-users will be connected to the smart grid, SNG is helping communities adopt this critical e-solution. Through our e-Solutions Benchmarking (eSB) studies, smart grids are one of the e-solutions SNG investigates to understand who is using broadband most effectively today so we can learn from them, and who is using it the least so we can raise their awareness and incentivize them. As you submit your Round 2 Broadband Stimulus application, make sure to include the measurement of expected outcomes and benefits from your proposed broadband investment. This will show you are confident in the impact your project will have – and welcome accountability. In order to fully appreciate the benefits derived from the use of the proposed broadband network, it is important to measure local outcomes. Yet, there is very little data related to community return on investment and the socio-economic impact of broadband and e-solutions, and none for [region name]. To address this issue, [Region name] is incorporating into the project metrics to track, benchmark and monitor productivity gains and other economic and socio-economic benefits from the utilization of broadband and e-solutions. Socio-economic metrics: capture of utilization patterns and socio-economic impacts and benefits of funding recipients and their targeted clients (institutions, businesses, organizations, individuals). The above metrics will help quantify and increase awareness of network benefits, identify best practices, and inform future policy and program development. I’m confident we can help secure Round 2 Stimulus Funds. I’d encourage you to reach out to find out how SNG can help. It’s a competitive process – you need every edge you can get. Visit our sites: sngroup.comm, brain.sngroup.com or arra-broadband.com to learn more, or dont hesitate to contact me. We’re ready to help you secure Round 2 dollars! NTIA administrator Larry Strickling recently expressed his confidence that broadband service providers will not only provide the detailed supply data requested by his agency (which includes more data elements than has ever been provided for a broadband mapping project), but also that they would waive the confidentially provisions that keep this data from being associated with specific companies. Though we certainly hope Mr. Strickling is correct, we don’t believe this will happen. And, just in case we are right, we recommend that states be ready to gather as much broadband data as they can – without relying too much on carrier cooperation. We suggest a two-pronged approach. On one hand, states should work closely, in good faith, with carriers to develop ways in which they can provide the data elements set forth in the NOFA while preserving their confidentiality. However, we warn states against becoming too dependent on carrier cooperation in the design and execution of their broadband mapping programs. Speaking at the recent Virginia Summit on Broadband Access, NTIA administrator Larry Strickling expressed confidence that broadband service providers will not only provide the detailed supply data requested by his agency, but also that carriers would waive the confidentially provisions that keep this data from being associated with specific companies.That sounds like a pretty “audacious” hope to me, though I certainly hope Mr. Strickling is correct. But, just in case he isn’t, we at SNG suggest that states be ready to put together as much broadband data as they can without relying solely on carrier cooperation. States and their broadband mapping contractors should, of course, work closely and in good faith with carriers to negotiate agreements and develop systems so carriers can provide the data elements set forth in the NOFA on terms that adhere to the document’s confidentiality provisions and that carriers find acceptable. But we don’t think it’s wise for states to rely solely on carrier cooperation in the design and execution of their broadband mapping programs. As the NOFA makes clear ( see pg. 45), NTIA is asking for more detailed data than has ever been provided for a broadband mapping project. The extent to which carriers will provide this data remains at best an open question.